The General Overseer of the Redeemed Christian Church of God (RCCG), Pastor Enoch Adejare Adeboye has retired. Pastor Adeboye, on Saturday named a new General Overseer (GO), Pastor J.O Obayemi, as his his successor, ahead of his 75th birthday on 2 March. The new GO is Pastor Joshua Obayemi was appointed the new GO at the Annual Ministers Thanksgiving at Shimawa, in Ogun State. The newly appointed GO was the former Special Assistant to the General Overseer (SATGO) on Finance. Adeboye also appointed Pastor Johnson Odesola, who was the Special Assistant on Administration and Personnel, as the church Secretary Pastor Adeyokunnu as church Treasurer. Pastor Adeboye had his B.Sc. in Mathematics at University of Nigeria Nsukka, and subsequently got his PhD in applied mathematics from the University of Lagos, and worked as a lecturer in Mathematics at the universities of Lagos and Ilorin, before going into full time priesthood in 1984. After joining the RCCG in 1973, he began working to translate the sermons of its then Pastor and founder, Rev. Josiah Olufemi Akindayomi, from Yoruba into English. In 1981, Adeboye was appointed General Overseer of the church. He took over from Papa Akindayomi, who had died the previous year. For three years he performed the role part-time, still lecturing at Ilorin. He finally gave up his university position to preach full-time. 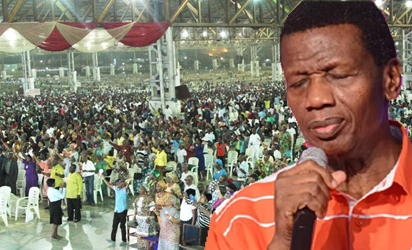 Adeboye has stated that his aim is to put a church within five minutes of every person on Earth. He married Adenike, now 68 in 1967. She was born on 13th July 1948.